We’d love your help. Let us know what’s wrong with this preview of Crossing the Chasm by Geoffrey A. Moore. Here is the bestselling guide that created a new game plan for marketing in high-tech industries. 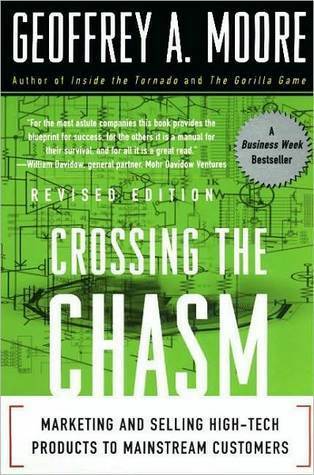 Crossing the Chasm has become the bible for bringing cutting-edge products to progressively larger markets. This edition provides new insights into the realities of high-tech marketing, with special emphasis on the Internet. It's essential reading for anyone with a stake in the world's most exciting marketplace. To ask other readers questions about Crossing the Chasm, please sign up. great book. thanks for share. When more ? In 2003 I reached a simple conclusion: I knew nothing about Marketing. Having created a Marketing company during college (after owning several businesses and spending more than a year selling advertising for a newspaper) with paying customers and everything! So, I immersed myself in learning everything possible about Marketing in the context of small privately held firms. After seven years, I can honestly say that I now know nothing about Marketing... except that I know more than 99% of the peopl In 2003 I reached a simple conclusion: I knew nothing about Marketing. Having created a Marketing company during college (after owning several businesses and spending more than a year selling advertising for a newspaper) with paying customers and everything! So, I immersed myself in learning everything possible about Marketing in the context of small privately held firms. After seven years, I can honestly say that I now know nothing about Marketing... except that I know more than 99% of the people who claim they do. This book changed my life, and the lives of my clients. I bought it in April 1999 and skimmed it. But it was not until April 2009 that I dug in to learn its secrets. I was simply amazed. A little knowledge can be a dangerous thing. This book lays out the mechanics of formulating and evolving a marketing strategy by exploring an extreme boundary case: introducing a fundamentally new product to the marketplace. The principles are relevant to all businesses everywhere. However, it would be wrong to view this book as a simple roadmap, because it is very hard to know where on the map you're starting. Do you really have something that will be regarded as a "disruptively innovative pro A little knowledge can be a dangerous thing. This book lays out the mechanics of formulating and evolving a marketing strategy by exploring an extreme boundary case: introducing a fundamentally new product to the marketplace. The principles are relevant to all businesses everywhere. However, it would be wrong to view this book as a simple roadmap, because it is very hard to know where on the map you're starting. Do you really have something that will be regarded as a "disruptively innovative product", or is it really just an incremental advance, subject to the rules of one of Moore's later books, such as the Gorilla Game? The most basic point of this book is that the tactics that serve you well at one stage will sink you in the next, so you better orient yourself properly before shouting and writing big checks. It was to the point, usable, concise and competent. Exactly what I would want in a book I'm reading for work. It's a rather short book, but still it took me over half a year to finish! - there were instructions and It was to the point, usable, concise and competent. Exactly what I would want in a book I'm reading for work. It's a rather short book, but still it took me over half a year to finish! - there were instructions and concrete steps to take to make use of this model and applying it to your own case. So overall I liked it and would recommend it. Lots and lots of opinions, directions, and instructions with very few reasons and evidence (let alone science) to back it up. The stories and anecdotes that are mentioned to back up points are cherry picked. Research on the credibility, track record, and net worth of the author only made my skepticism increase. I cant say his directions are wrong. But I wasn't convinced they were right. I'm sure many other people have failed to even consider these components before rushing to implement on his ad Lots and lots of opinions, directions, and instructions with very few reasons and evidence (let alone science) to back it up. The stories and anecdotes that are mentioned to back up points are cherry picked. Research on the credibility, track record, and net worth of the author only made my skepticism increase. For a reason, this book should be labeled as a textbook, not like a free-time one. It took months to finish it and yet I believe I need to recap, revise and find other summaries for it. Although I got the 1997 edition, it is yet relevant to the high tech industry nowadays. Yet, found it hard to get the examples of the 90s companies that are no giants, or even exists, now. This book gives a fresh and powerful set of tools to help navigate the stages of product life, as well as covering honestly some of the hard decisions that must be made. A great book for those interested in making their technology sustainable and more than just a passing fad. Page 49 last This book gives a fresh and powerful set of tools to help navigate the stages of product life, as well as covering honestly some of the hard decisions that must be made. A great book for those interested in making their technology sustainable and more than just a passing fad. Первый разрыв — между новаторами и ранними последователями. Этот разрыв возникает, когда продукт новейшей технологии не может быть сразу же использован как нечто не только принципиально новое, но и существенно полезное, расширяющее наши возможности. На примере эсперанто. Энтузиаст обожает этот язык за архитектуру, но больше никто не может даже понять, где его использовать. маркетинг: это действия, направленные на создание, расширение, удержание и защиту рынков. Суть в том, что, в отличие от технологических энтузиастов, провидец извлекает пользу не из технологии самой по себе, а из прорыва, которого она позволяет добиться. В основе реформирования лежит принцип: победа в маркетинге чаще всего означает, что вы — самая большая рыба в пруду. Но если мы очень малы, тогда нужно искать маленький пруд. Ранние последователи обычно приходят с заказом к вам сами, как правило они основываются на мнении первых гиков. Захват плацдарма и попадание в первую цель запускает динамику последовательного принятия технологии, что открывает перед ней новые рыночные возможности, отчасти за счет продвижения решения от одной ниши к другой, отчасти за счет передачи информации из уст в уста клиентами смежных ниш. Один — поражение первой цели, захват плацдарма, преодоление пропасти. Второй момент — планирование выхода на смежные сегменты рынка, где ваше первоначальное нишевое предложение может найти применение. Теория пропасти гласит: «Действуйте локально,затем глобально». условиях недостатка или вообще отсутствия необходимой информации. Сценарий: заголовок, пользователь, технический покупатель, экономический покупатель. День из жизни (до): Место действия или ситуация, Желательный результат, Неудавшаяся попытка, Мешающие факторы, Экономические последствия. Имейте в виду, что лучшими сценариями будут те, что подразумевают законченное решение. Главное - за год стать стандартом де факто на выбранном рынке. Для этого нужно в течении первого года получить не менее половины заказов на выбранном рынке. Поэтому не нужно сразу стремиться выйти на самый богатый сегмент. 2. Назначьте подкомитет для выбора целевого рынка. Сократите число его членов до минимума. Единственное важнейшее различие между ранним и основным рынком заключается в том, что на первом согласны взяться за превращение товара в целостный продукт (в обмен на опережение конкурентов), а на последнем — нет. Неспособность понять этот факт стала причиной неудач многих хайтек-предприятий. Тактические альянсы преследуют одну-единственную цель: ускорить формирование инфраструктуры целостного продукта в пределах конкретного сегмента рынка. См "Резюме: советы по управлению целостным продуктом"
В общем, прагматики не хотят покупать, пока не могут сравнить. Ключ к успеху — концентрация на интересах и ценностях прагматиков, а не провидцев. В хайтек-маркетинге есть четыре критерия ценности продукта: технология, продукт, рынок и компания. • Мы собрали воедино ____ (ключевые качества целостного продукта, предназначенного для вашего конкретного применения). После преодоления пропасти пионеры должны стать колонистами. Однако, чтобы действительно оставить пропасть позади, нужно прекратить работы на заказ и сконцентрировать все усилия на выведении на рынок целостного продукта, добиться того, чтобы продукт удовлетворял стандартам, соблюдения которых требует рынок. в период преодоления пропасти две новые роли. Исследование и разработка целостных продуктов — новая область знаний. I wasn't really sure if this was going to be for me (and the latest edition is form 1998, so, it might have been a bit dated) but this was actually a great surprise. The idea of the chasms when marketing products, specially in tech, really resonates with what happens in the market and we can compile a huge list of companies and products that have died somewhere along the way while trying to cross one of the chasms to become a mainstream product. The book defines markets as So, product development! The book defines markets as groups that can refer to themselves, since you can't really hope a doctor will refer and have many friends in architecture, so the main goal is to be able to create a presence in a market where people can refer and talk about your product among themselves as you can't possibly pay for marketing for every single person there. The charms are defined as innovators, the first market, where you excite the people most interested in whatever new thing you have (think about the first geeks buying smart home appliances). These people are mostly interested in the novelty of your stuff and will try to direct the product, they're extremely helpful in trying to come up with an actual product at the end but focusing too much on them will pull you in many different directions, so while it's important to have them on your side, you can't just follow them blindly otherwise you won't be getting anywhere. Then you have the early adopters. These are the people influenced by the innovators you have, they're also interested in the improvement but they will be less engaging than the innovators. These people are less prone to bugs, errors or support requirements but they're the start of your upward race collecting more customers and building a better product that could possibly find it's way to the mainstream market. Then we have the great chasm to reach the skeptics mainstream customers, this is where stuff gets really hard and you'll really need to up your game as the people here are pragmatists and conservatives. They don't want to invest money in something new just because it's shiny, they need a good reason and a working product, some prototype that requires a lot of handholding from an unknown company won't do it here, you must have already sorted out most of the kinks in your product and you need to be ready to own the market. To do this the book offers segmentation, preparing a D Day operation to attack a very specific market that you can corner and own, since being the top brass in such market makes these pragmatists and conservatives much more likely to buy from you. This requires focus and forfeiting embrace everything solutions (that wouldn't work, anyway) and will give you much better results. The book then goes about pricing (and it's a great discussion, like how much money you need to be making to have an actual sales force and product price point), partnerships and other stuff involved. [Summary] Successfully getting lead users is different from successfully entering mainstream market. Traditional technological product adoption cycle has a huge flaw on its premise. It assumes that the adoption of the product will automatically diffuse from early users (technologist and visionary users) to followers (early majority, late majority, and laggard). In fact, we should concern about the different set of paradigm in which we use to attract and communicate with both group. Early users w [Summary] Successfully getting lead users is different from successfully entering mainstream market. Traditional technological product adoption cycle has a huge flaw on its premise. It assumes that the adoption of the product will automatically diffuse from early users (technologist and visionary users) to followers (early majority, late majority, and laggard). In fact, we should concern about the different set of paradigm in which we use to attract and communicate with both group. Early users will put their focus on technological breakthrough, aiming to achieve superior competitive advantage while taking higher risk. following users, except laggard, will focus more on stability of product innovation to ensure that they will not burn their money for the waste. I began this book exploring a product to launch and finished it working in the business services industry. This juxtaposition helped me make sense of Moore's analysis and see its limitations. For high-tech, or most new products, Moore is spot on. There is an adoption curve and the key challenge for success in these kinds of ventures is moving from early adopters to the mainstream. His strategy (summed as 'focus') is the way to conquer this challenge. For services, I'm not as sure. My business is d I began this book exploring a product to launch and finished it working in the business services industry. This juxtaposition helped me make sense of Moore's analysis and see its limitations. For services, I'm not as sure. My business is defined as singular events: consultation meetings, coaching sessions, and drafting language for others to deliver. While his advice (narrow focus leads to strong results) does not yet resonate with me. I'm still at the stage of figuring out what I do best and what customers need most. Frankly, most small service businesses (singular self-employed ventures) stay in this stage. Here we tinker, bring others in to solve tough problems. We never reach a 'mainstream.' And we shouldn't: when you can mass-produce professional services, you lose the real value created. This is certainly one of the most insightful business books i have ever read. It is of biblical importance to anyone in the technology business, especially operating in a B2B scenario. Apart from a cogent theoretical framework, it provides high practical, and actionable advice on how to move from one segment to the next in a technology adoption life cycle. It has certainly shown me the wrong assumptions we have made in our own business, and why. The book helps consultants create a concrete service This is certainly one of the most insightful business books i have ever read. It is of biblical importance to anyone in the technology business, especially operating in a B2B scenario. The book helps consultants create a concrete service offering to start-up clients who need advice on their go-to-market and organizational strategy. Every MBA that I know has since told me that this is a classic, and I can see why. I never knew where the concept of early adopters and the technology adoption life cycle came from. The book is well written, has a compelling concept -- the "chasm" that must be crossed from visionaries and innovators to mainstream use in tech companies and that this crossing requires completely different techniques and types of people -- and is SHORT. I love short business books. Thanks to Will, my sculptor/altern Every MBA that I know has since told me that this is a classic, and I can see why. I never knew where the concept of early adopters and the technology adoption life cycle came from. The book is well written, has a compelling concept -- the "chasm" that must be crossed from visionaries and innovators to mainstream use in tech companies and that this crossing requires completely different techniques and types of people -- and is SHORT. I love short business books. It's a classic... and the point it makes is solid (more or less, that the skills needed to make an innovative product for early adopters are very different from those to make a mass market whole product). That said it's very dated, and most of the advice pertains to large products. The paradigm it establishes has no room for crowdfunding, or for companies like 37signals that don't hardsell anyone. It's a very sales-driven viewpoint on things for a corporate world that's very focused on the bottom It's a classic... and the point it makes is solid (more or less, that the skills needed to make an innovative product for early adopters are very different from those to make a mass market whole product). That said it's very dated, and most of the advice pertains to large products. The paradigm it establishes has no room for crowdfunding, or for companies like 37signals that don't hardsell anyone. It's a very sales-driven viewpoint on things for a corporate world that's very focused on the bottom line. I think this a great fundamentals book for any technologist or product manager (not mutually exclusive) to read. There are some really evergreen pointers on developing markets, product positioning and more. It's clear that a lot of product strategy books drew inspiration from Crossing the Chasm. One drawback is that there are some outdated references and examples, but most are still relevant. The book adressed a lot of issues relevant to my current company directly. First of all, the chasm model applies in B2B scenarios. This is not a b2c marketing book even if some ideas do apply. What I found interesting was that this book provides this model describing 5 different types of customers. Then we find ways in which to address these customers, the proper timings, the proper sales pitches, the product pricing, the competitors, the strategic partnerships, the development team, and even the compensation appropriate for the team, in order to attack each of the 4 market segments (1 market segment, or psychographic, as the author calls it, being pretty unapproachable). For me it would be an honest 4.5, as I didn't see a lot of references to more formal papers, but just to a few other books, and I don't want to just trust the author's wisdom on this, even if the book seems full of good ideas, and great explanations, and showcases nice ways of thinking about problems. I recommend this to anyone living in a capitalist system, seriosly....But more seriously indeed, this is very good for developers that work in product companies. All of the marketing, sales and management stuff will make a hell of a lot more sense after this book! For marketing and sales people I'm not sure what to recommend, but the book does claim to create a common vocabulary for the different departments of an organization, so dunno, maybe try it, marketing/sales/management folks! I picked this up thinking it was a mountaineering book, based on the title. Turns out it’s actually about marketing high-tech products in a B2B context. I thought this was really well written. I’ve had it recommended by a number of lecturers and I can see why. The main idea is that breaking into mainstream markets is best achieved by first narrowing the firm’s focus to a specific segment where the product can be established as the clear leader. Although the subject matter gets a little dry, Moore’ I picked this up thinking it was a mountaineering book, based on the title. Turns out it’s actually about marketing high-tech products in a B2B context. Although the subject matter gets a little dry, Moore’s attempts at jokes keep things entertaining. He also writes in a way that shows the broad applicability of his ideas (outside high-tech B2B selling). Essential reading for any B2B entrepreneur. Moore's principles for "crossing the chasm," - the critical period between marketing to early adopters and more pragmatic buyers - are extremely compelling and practical. I found the examples and case studies relatable and useful, and will revisit again and again. Plus, my old company Visible Measures got a great shoutout in it. One of the best marketing books I’ve read. If I have to pick a single thing I’ve learnt, that’s probably about the importance of finding and winning a single market segment and focus all resources on that goal in order to pave the way to the mainstream market. I wish I had read this one earlier. Let's just say I took copious notes. I'm also writing an abstract to share with my team. Should be required reading for any tech startup. This completely changed my understanding about marketing. The principle is that the buying needs of technical visionaries and the early mainstream markets are different. The former are prepared to take risks with innovative technology in the search for breakthrough improvements; the latter expect an established, whole product proven in use by people they can reference. The "chasm" is the Catch-22 situation of needing an existing mainstream customer base before mainstream customers will buy one. Th This completely changed my understanding about marketing. The bulk of the book explains why and how to carry out the steps to cross the chasm. I'm in the process of applying this myself now, so I can't comment on it's efficacy. But, it's a very clear and practical description. An oldie but a goodie. This manual in the pains of starting a new business. My favorite passage, which I believe is the intro, is where the author describes his glee to be on the other side of start-up life with real money in the bank, and how knowing what he knows now he would never want to do it again. But, from the safety of his new home he's willing to share some actual lessons from his start up life in the fitful infancy of the internet industry. That said, there are interspersed with bits o An oldie but a goodie. This manual in the pains of starting a new business. My favorite passage, which I believe is the intro, is where the author describes his glee to be on the other side of start-up life with real money in the bank, and how knowing what he knows now he would never want to do it again. But, from the safety of his new home he's willing to share some actual lessons from his start up life in the fitful infancy of the internet industry. The book gives understanding and tools how to go beyond early adopters to mainstream customers and the big growth. The perspective in the book is the startup's. But knowing these things helps established enterprises to fight back new entrance. It's one of those must reads for entrepreneurs and investors. Valuable for founders, investors, marketing, sales and finance people. One of those books worth going back to once in a while. Excellent book on how to move from an early market to conquer the mainstream market, in which the majority of profit resides. However there are points that can be made clearer or easier to understand for people without a marketing background. Overally, this is a classic book on this topic. Probably the latest edition is updated to provide clearer explanation, as the version that I read is the revised version from the first edition. I liked the way Moore breaks down the hi-tech adoption curve- the step by step process of taking a disruptive technology to market is impressive and useful. I liked the analogy of D-Day to entering the early majority segment, and also the characterization of each segment based on what conditions must be met for them to buy. 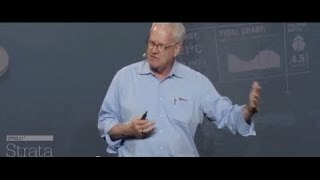 Geoffrey Moore is an author, speaker, and advisor who splits his consulting time between start-up companies in the Mohr Davidow portfolio and established high-tech enterprises, most recently including Salesforce, Microsoft, Intel, Box, Aruba, Cognizant, and Rackspace. Moore’s life’s work has focused on the market dynamics surrounding disruptive innovations. His first book, Crossing the Chasm, focus Geoffrey Moore is an author, speaker, and advisor who splits his consulting time between start-up companies in the Mohr Davidow portfolio and established high-tech enterprises, most recently including Salesforce, Microsoft, Intel, Box, Aruba, Cognizant, and Rackspace. Moore’s life’s work has focused on the market dynamics surrounding disruptive innovations. His first book, Crossing the Chasm, focuses on the challenges start-up companies face transitioning from early adopting to mainstream customers. It has sold more than a million copies, and its third edition has been revised such that the majority of its examples and case studies reference companies come to prominence from the past decade. Moore’s most recent work, Escape Velocity, addresses the challenge large enterprises face when they seek to add a new line of business to their established portfolio. It has been the basis of much of his recent consulting.